St Arnaud, a rural town, is at the west of the Victorian goldfields region and is 95 km west of Bendigo. It is on the Sunraysia Highway and railway line to Mildura. The origin of St Arnaud’s was the discovery of gold at a sandy knoll later called Bakery Hill, St Arnaud north, in January 1855. The resulting goldfield was known as New Bendigo, and mining spread into several hills and gullies. In 1856 a town was surveyed about 6 km east of the goldfield. It was named St Arnaud, after a French military commander in the Crimean War. Because of the town’s distance from the goldfield the survey was cancelled and a township developed around the mining activity. The community readily adopted the proposed name, and sales of township lots occurred in 1858. St Arnaud did not boom for several years, although the search for reef gold began in late 1855. The settlement existed on alluvial gold and several reefs which were exploited for silver and gold, until the Lord Nelson Company (1883) developed a profitable operation which lasted until 1913. The town's people nevertheless had faith in St Arnaud’s future and the St Arnaud municipality was proclaimed on 12 August 1861, and its named was given to an extensive road district in the same year. A newspaper, the St Arnaud Mercury, was begun in 1864. A Combined Protestant school was opened in 1857, and the first of several churches, a Wesleyan one, was opened in 1861-62. One of the problems for the town and for quartz crushing operations was a shortage of water. In 1864 the Goldfields Reservoir was built about 3 km west of St Arnaud. During the 1870s three flour mills were built in the township, a sure sign that its economy would not be solely dependent on mining. 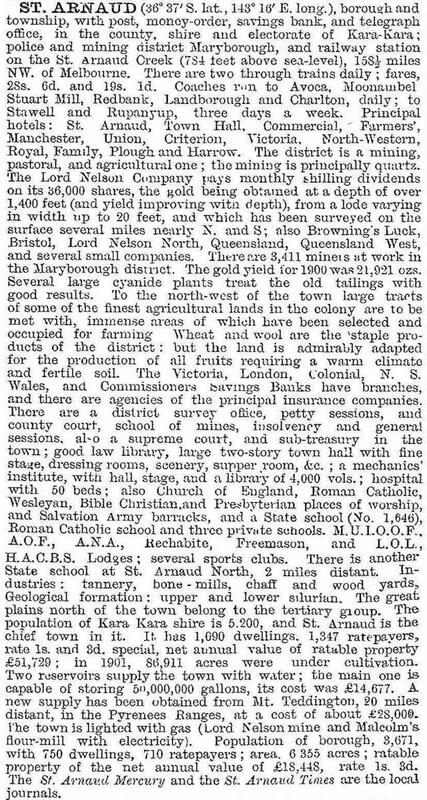 A pastoral and agricultural society was formed in 1872. In 1878 the railway was extended from Dunolly to St Arnaud. There were also Anglican (1865), Catholic (1875) and Presbyterian churches (1876), a second newspaper, the St Arnaud Times (1874) and a hospital (1874). Despite the inevitable poppet heads and mine tailings, St Arnaud gained the basis for an attractive townscape. A botanic garden along Napier Street, opposite the court house, was laid out in 1885. Many buildings were made from local bricks which acquired an attractive reddish-brown hue. There were few timber structures which could fall into dilapidation. When Lord Nelson mine closed in 1913 the town already had the experience of levelling mine waste for King George Park next to the botanic garden. Ultimately the Lord Nelson site was changed into a large reserve, much of it designed by Edna Walling in the 1930s. It also has a showground, racecourse and caravan park. A swimming pool was opened in 1941. Restoration of the park, closely following Walling’s design, began in the early 2000s. 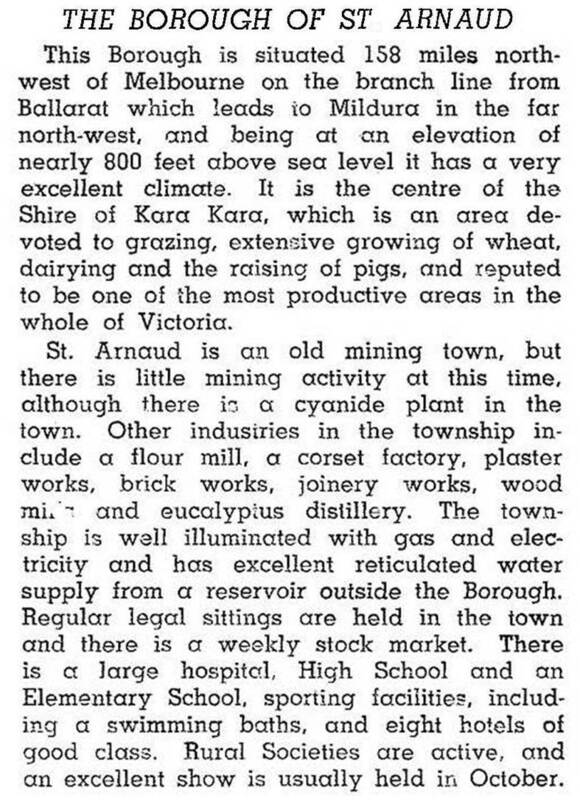 St Arnaud’s population in 1947 was 2900 people. It peaked at a little over 3000 in 1966 and had nearly 2900 in 1991. It has gained a role as a sub-regional centre. This has not been without some loss to the former surrounding Kara Kara shire, the population of which nearly halved during 1921-54 and fell by another 500 to 1150 people during 1954-91. (The shire offices graced St Arnaud’s main street, opposite the botanic gardens). The relatively steady postwar population level has enabled St Arnaud to keep most of its grand verandahed hotels. In 1980 the Australian Heritage Commission declared the St Arnaud conservation area, taking in both sides of Napier Street from the botanic gardens to the junction of Napier Street and the Wycheproof Road. The court house (1859-87), the Crown Lands Office (1876), the police lock-up (1862) and the railway station (1879) are heritage listed. In addition to the gardens and reserve already mentioned, St Arnaud has a sports complex and tennis courts in separate reserves. There is a primary school (172 pupils, 2014), a secondary college (216 pupils, 2014), a Catholic primary school, six churches, a golf course, womens' and mixed bowling clubs, a substantial shopping area, a historical museum, a visitor information centre, a caravan park and three motels. The Catholic secondary school, which shared campuses with Charlton and Donald, was moved to Dooboobetic, which is equidistant from the three towns. The State government's Department of Primary Industry office in St Arnaud, that provided support and advice to the region’s farmers, closed in 2012. The municipality of St Arnaud became a borough on 1 October 1863, a town on 17 October 1950 and was united with Stawell city, most of Kara Kara and Stawell shires, and parts of other municipalities to form Northern Grampians shire on 20 January 1995. The St Arnaud Range National Park was renamed the Kara Kara National Park in 2011 to acknowledge the Aboriginal heritage of the site. In 2014 a 24-turbine wind farm was approved located between Wedderburn and St Arnaud and was expected to generate 72 megawatts of electricity.